Musically speaking Leipzig is inextricably linked with the name of Johann Sebastian Bach. For that reason we know pretty much about the musical climate in which he had to work. Whether this has resulted in a balanced view is a different matter. The way the town council elected a successor to the deceased Thomaskantor Johann Kuhnau in 1723 and the many conflicts between Bach and the authorities could give the impression that Leipzig was a rather narrow-minded community. However, that is far removed from the truth. For many years Leipzig was one of the main intellectual and cultural centres of Germany. Many composers of fame were students at the Thomasschule, among them Christoph Graupner, Johann David Heinichen, Johann Friedrich Fasch, Gottfried Heinrich Stölzel, Reinhard Keiser and Johann Georg Pisendel. Others studied at Leipzig University and played a key role in music life; the best-known of them is Georg Philipp Telemann. He also functioned as a major figure in the Leipzig opera which had been founded in 1693 by Nicolaus Adam Strungk. It was only the second public opera house in Germany - after the Oper am Gänsemarkt in Hamburg, which was founded in 1678. Telemann was also for some years at the helm of the Collegium Musicum which gave concerts in the town's coffee houses. This disc documents sacred music as it was written in Leipzig before the arrival of Johann Sebastian Bach. This was the time Johann Kuhnau was still Thomaskantor; apparently he viewed the newest trends in music, including music written for the church, with scepticism. In the original German version of the liner-notes he is quoted as criticizing a style of composing which was strongly influenced by (Italian) opera and laid emphasis on the importance of expressing "emotions and words in music". However, this conflict should probably not be exaggerated: Kuhnau composed many sacred concertos which are stylistically rooted in the 17th century, but also modern cantatas with recitatives and arias. Unfortunately his sacred oeuvre is hardly explored as yet and that makes a balanced assessment of his style and his attitude towards the stylistic developments of his time almost impossible. One thing is for sure: Kuhnau was anything but narrow-minded. He was rather an uomo universale, who was active as a lawyer, but also as an author of various books, spoke several languages and was also knowledgeable in theology and mathematics. In the music chosen for this disc we meet the same kind of mixture of traditional and modern elements as in Kuhnau's sacred oeuvre. The programme opens with Ich hebe meine Augen auf by Telemann. It is a setting of Psalm 121 and dates from around 1705. It shows some similarity to the early cantatas by Bach: there are no recitatives, only duets and arias for soprano and bass. The texture is still very much that of a 17th-century sacred concerto; da capos are absent. There are some eloquent examples of word painting, for instance extended coloratura on "gleiten" (glide away) and long held notes on "schläfet" (sleeps) and "schlummert" (slumbers). When Christoph Graupner left the Thomasschule he enrolled at Leipzig University where he studied law. In 1706 he left the town in a hurry under the threat of a Swedish military invasion and moved to Hamburg. During his years as a student he participated in the Collegium Musicum under Telemann's direction. Whether he composed any sacred music at the time is not known, but seems rather unlikely. 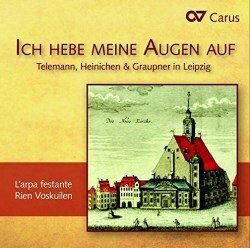 This disc includes Vergnügte Ruh, beliebte Seelenlust, a cantata for the sixth Sunday after Trinity, written in 1711. At that time he was already vice-Kapellmeister at the court in Darmstadt. It was part of his first annual cycle of church cantatas; the text was from the pen of Georg Christian Lehms. He had moved to Leipzig to study in 1707 and soon wrote many texts for newly-written sacred compositions which were performed in Leipzig, especially at the Neukirche. The inclusion of this cantata is probably more motivated by the date and place where the text was written than where the music was composed. The cantata is scored for soprano with an ensemble of two flutes, two violins con sordino, violetta and bc. In this recording the flute parts in the opening and closing arias are played by recorders; this is not mentioned in the booklet, and I can't figure out why the transverse flutes were replaced here. It includes two expressive recitatives in 'operatic' style, much as we know them from Bach's cantatas composed at a considerably later time. The second aria includes a short recitativic passage. Johann David Heinichen is mainly known for his instrumental works, but he also composed some church music; a substantial part of it has been lost. Herr, nun lässest du deinen Diener is for Candlemas (2 February); the oldest copy has 1714 as the year of composition. However, it is likely to have been written some years earlier, probably 1709 when Heinichen worked in Leipzig as director of a collegium musicum. It opens with a sonata; in the second section we hear the melody of the chorale Freu dich sehr, o meine Seele. It is followed by the opening chorus; the second section is a fugue. The second chorus, 'Denn meine Augen haben deinen Heiland gesehen', has the same texture. These choruses embrace two da capo arias, for bass and tenor respectively, which are written in the modern operatic style we also find in Bach's cantatas. The second chorus is followed by a short aria for bass with some vivid word painting. Then follows a duet for soprano and alto; this leads to a stanza from the above-mentioned chorale Freu dich sehr, o meine Seele, sung by the soprano; alto, tenor and bass now sing the text of the duet. This section ends with the closing line of the duet, sung by the tutti: "I ascend to heaven". The cantata ends with a four-part chorale which is the opening stanza of Freu dich sehr; the orchestra plays ritornelli between the lines. Although this work basically reflects the modern cantata style, there are no recitatives. In its texture it has some similarity with Telemann's psalm setting which opened the programme. The inclusion of an orchestral overture by Telemann is a bit odd, considering the overall subject of this disc. The second movement from the Overture in E flat is called Entrée; in his liner-notes Michael Maul states that this could suggest that the opening ouverture was first written for one of the operas Telemann composed for Leipzig. However, it is not very likely that this orchestral suite was written in Leipzig. It seems more plausible that it was composed for the courts of Sorau or even Eisenach where Telemann worked after he had left Leipzig. It was only in Sorau that Telemann became acquainted with the French style which resulted in a large production of orchestral suites. The overture is scored for strings and basso continuo; here two oboes play colla parte with the violins, as was common practice in the orchestra of Jean-Baptiste Lully. The works by Heinichen and Telemann are recorded here for the first time. Especially the vocal oeuvre of Heinichen needs some investigation; hardly anything of that is known. The exploration of Graupner's vocal oeuvre has only just begun, and we may expect to discover many gems in his large output of around 1,400 sacred cantatas. The music on this disc is fascinating stuff. It shows the stylistic developments in the composition of church music in the early 18th century in Lutheran Germany. We know the cantatas of Bach and some of his contemporaries, and also many 17th-century sacred concertos, but the time of change - roughly speaking the period 1690 to 1710 - is not that well documented. This disc is a major contribution to our knowledge of that period. The performances could hardly be better. Rien Voskuilen rightly decided to perform this repertoire with one singer per part in the tutti; this was probably the standard at the time, although the participation of ripienists may be justified. The singers are very experienced interpreters of German sacred music, and this results in completely idiomatic performances. L'arpa festante is also excellent in the realization of the instrumental scores, and that includes some nice obbligato parts.